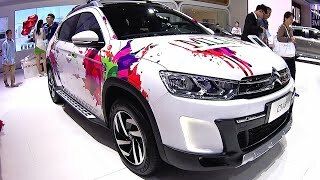 Citroen at its flagship showroom in Paris and on the day when the diplomatic relations between France and China completed its 50th anniversary unveiled its new C3-XR Crossover 2015. The model very closely follows the benchmarks set by C-XR Concept uncovered in Beijing earlier this year. With its very launch the C3-XR 2015 has joined the league of C3 range with five door hatch and C3 Picasso minivan. The only difference is that this model in particular is targeted for its Chinese market. For those of you who are new to the brand, we would like to bring into your notice that the every year out of every four sales one in China is a Citroen. This fact clearly narrates the success story of this new model. As per the details about the launch, the model will hit the Chinese market by the end of this year. Looking at dual-aspects, the Citroen history and the model one thing is sure that the model is dynamic and is also anticipated to soon occupy the international markets after ruling the Chinese streets. Well being precise the company has long travelled with their very same motive. Buyers can very well expect comfort, distinct looks and high performance from the C3-XR in its segment. The Citroen C3-XR 2015 will also bring with it reversing camera, flawless grip control and keyless entry and starting of vehicle. Though not much has been shared about the model but going upon the words of a French automaker, the Citroen C3-XR crossover 2015 will be mounted with a gasoline 1.6 liter turbo four cylinder engine under its hood, delivering 160 horsepower and mated to six-speed automatic transmission. Regarding more detailed information related to Interior, Exterior and Performance of C3-XR, we can just request you to keep visiting us. We’ll be updating them as early as the company reveals the information and specifications.